I’ve been looking for a basket of specific dimensions for a while without any luck. Then I saw a circular version of this idea and realised I could make my own! 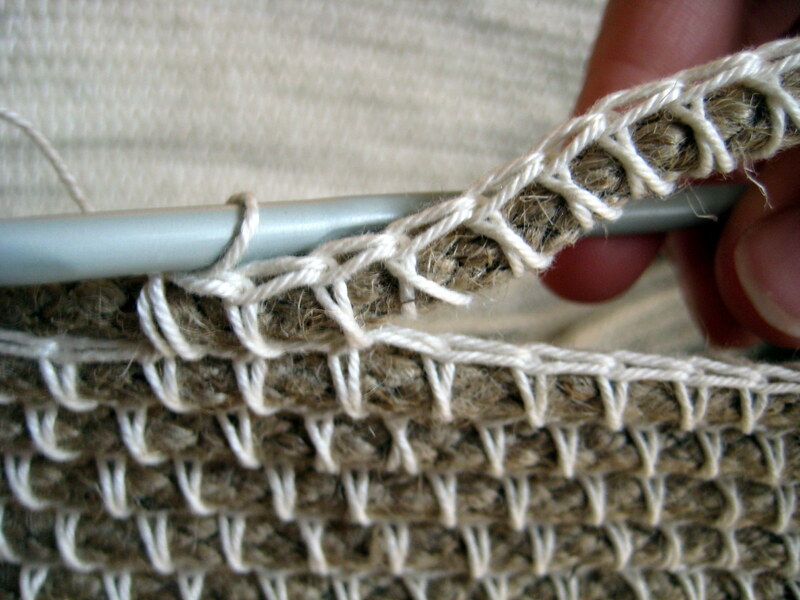 This uses a technique similar to thrumming, where you crochet over another thread to add bulk to a fabric. 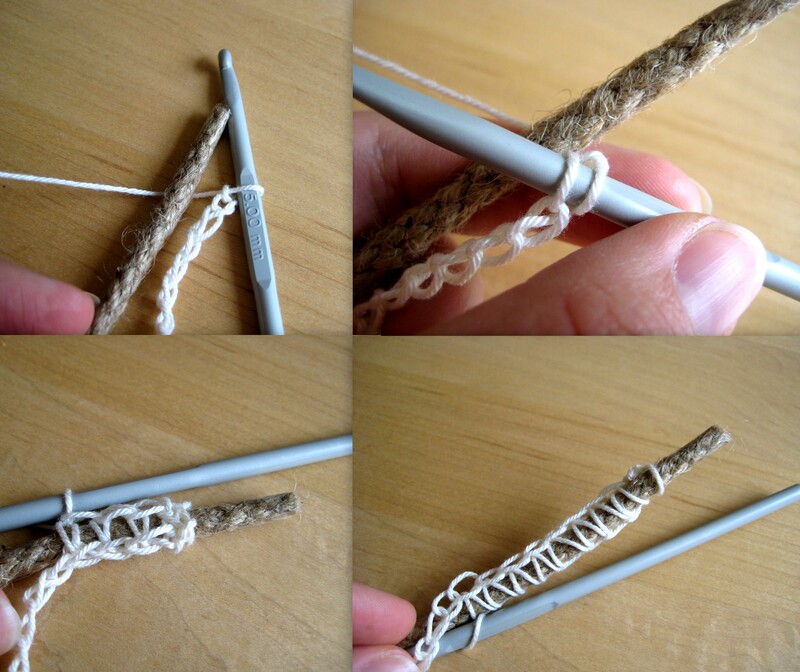 If you have ever crocheted over your ends to avoid weaving in, this works the same way. In this case I used rope instead of another yarn, which is a lot bulkier but great for adding stiffness and making each row deeper. This project had the added bonus of using up a single skein I had left in my stash! 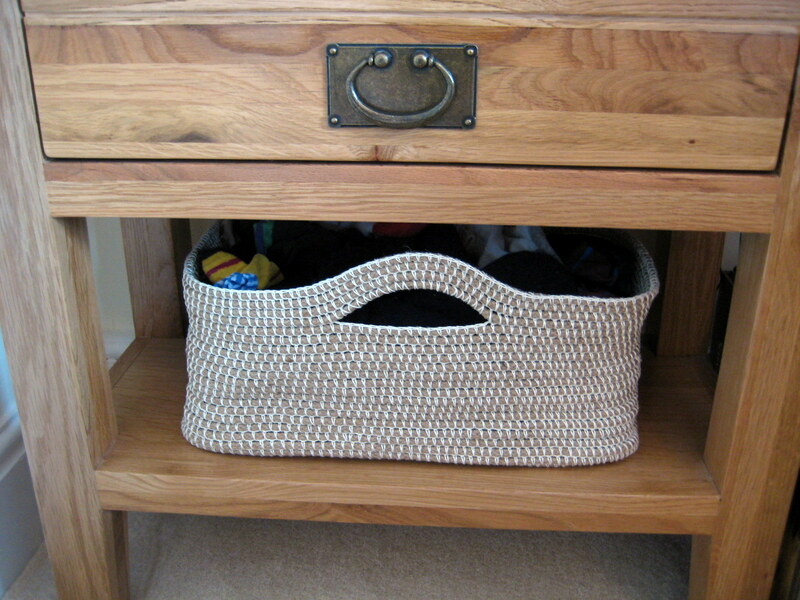 The resulting basket is rectangular with rounded corners. 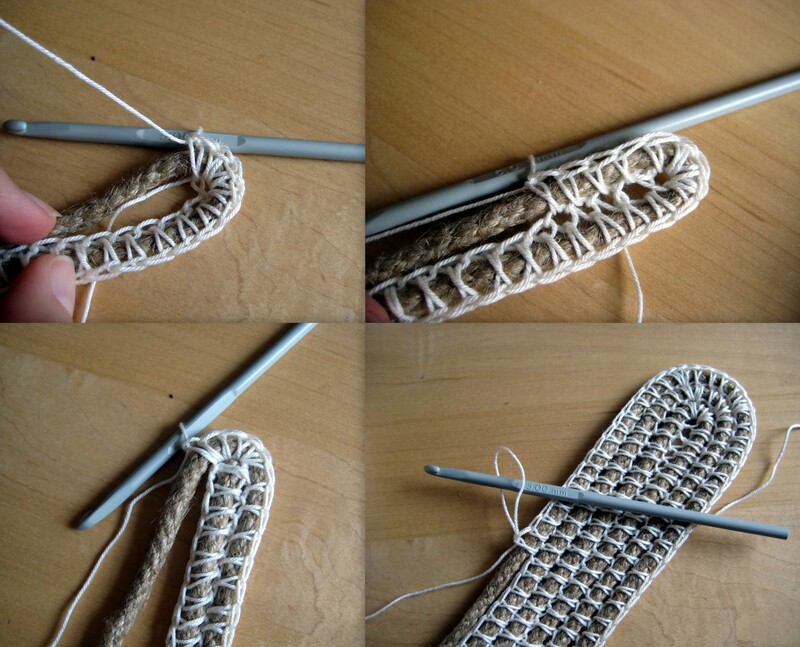 Size 5.00mm crochet hook (use a metal hook if possible as the work is quite stiff), or larger if your rope is thicker. Foundation row: Decide what size base you need. Mine was 22 by 42 cm. The difference between the two dimensions (in my case 20cm) is how long a chain you need to make to begin. This was 30 or so chains for me. Lay the rope alongside the chain to work with an overlap of a few cm. Round 1: sc (working over the rope) in 3rd ch from hook. Complete a few more sc and then wriggle the rope forwards to line the end up with the beginning of the row (i.e. get rid of the overlap). Sc to the final ch, 5 more sc in final ch (turning the rope around the “corner” and rotating work), sc to end. Subsequent rounds: 3sc into each corner st and sc in all the other sts. Continue until the work is your desired base dimensions. 1&2: Turning the corner on round 1, 3: beginning round 2, 4: part way through round 3. Transition to working the sides: Once the base is large enough, stop putting 3sc in each corner st, just do 1sc in each st around. For the first round of this you will need to make sure you lie the rope vertically on top of the row below, which can be a little fiddly. Handles: These are optional. When the sides are high enough, and after completing a round, place st markers where you desire your handles to be. Now when you reach a marker, leave the next set of sts unworked (I left 15sts to make mine), and instead crochet over the rope more sts than you have left unworked (I did 20 sts over the rope). Continue to sc in the sts after the marker as before. Insert hook in next st, draw up a loop, yarn over, draw through one loop, insert hook in same st, draw up a loop, yarn over, draw through 2 loops. Finish with an sc in the next st, but not over the rope. Trim the rope if needed, and weave in all ends. Hi Maggie! The easiest thing to do is to lie the base on a flat surface like a large table or the floor. 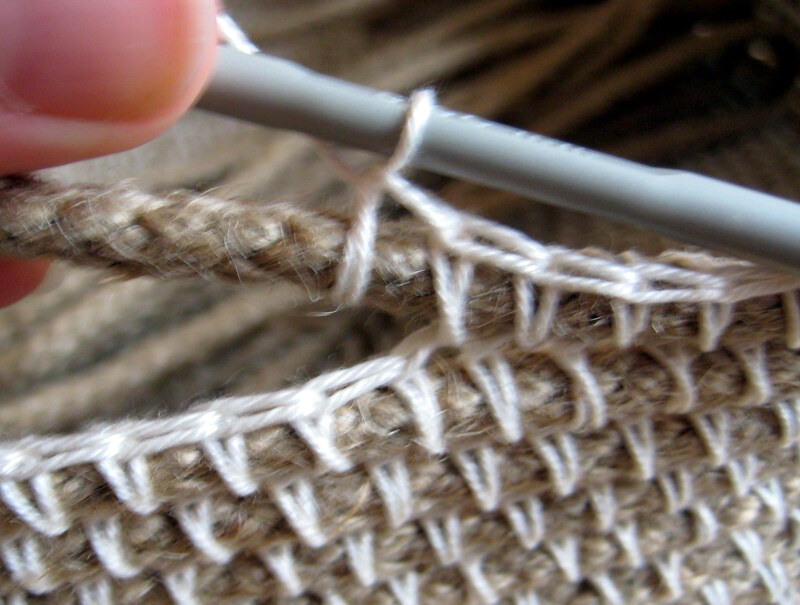 Then lie the rope directly over the last round and hold it there firmly and crochet the next round really tightly to secure it, working just one sc into each st. Work a few rounds the same way to establish the sides. 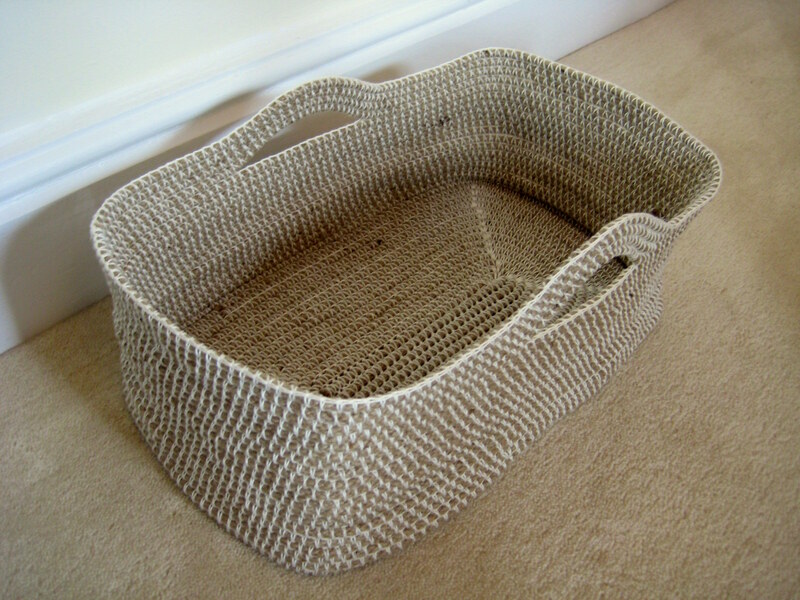 First attempt at something like this currently resulting in…… oval basket and thicker looking binder (cotton yarn)….. 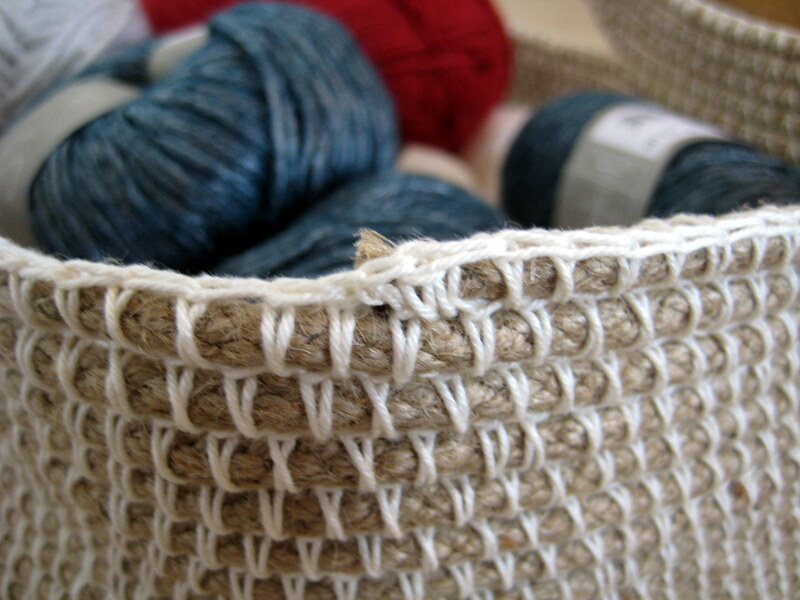 I double checked everything and it all matches… Not sure why your cotton yarn looks more like thick thread…. 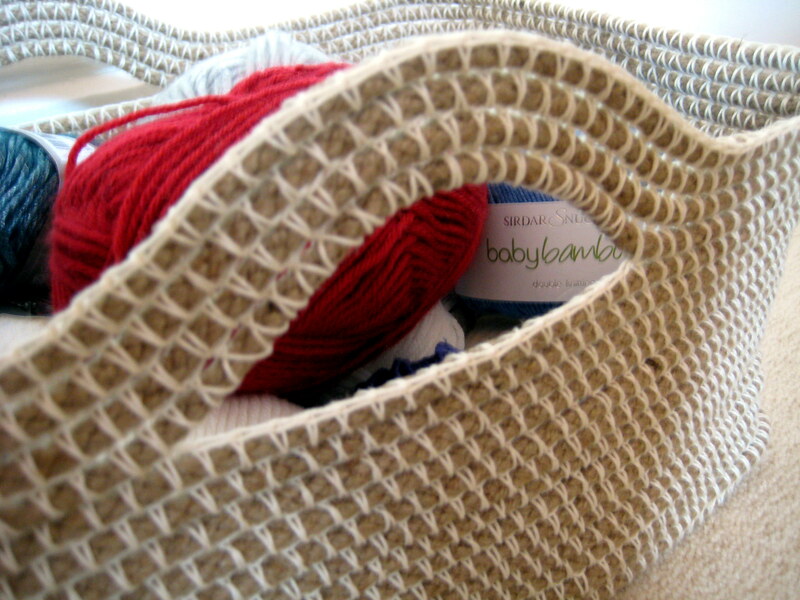 I used Peaches and Cream 4 ply 100% cotton…. Maybe that’s the difference? Can’t wait to attempt #2 and see what results I get! Hi Michelle! You have to really shape the corners to get a more rectangular shape. The example shown doesn’t have perfect corners so please don’t get too hung up on attaining them – it depends a lot on the flexibility of your rope. I used a sock weight yarn but that won’t affect your corners too much. 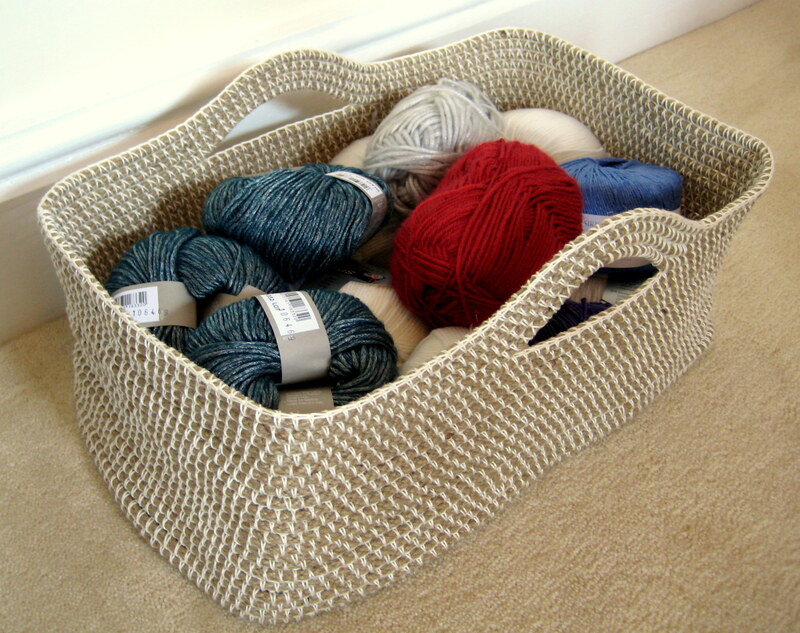 There’s a lot of great projects on Ravelry showing the variety of baskets people have made using this pattern – worth checking out as many have used very different rope and yarn! I’ve also noticed tension is key while making this! A couple rows I didn’t do as tightly as the rest and it buckles at those rows. I also went and bought crochet hook cushions. Really saves on the “hit” spots on the fingers when crocheting so tightly. Thanks for sharing! I hope to make one soon! Fish twine would work wonderfully on this. Will have to try. What a great idea! I’ve made Boodles baskets before but this looks great. I’ll add it to my ‘to do’ list! Very hard to do with arthritis, having the devils own job on the first corner. Might end up as a UFO if I can’t get it soon. It is hard work on the hands I’m afraid! I’d recommend trying a sample size version if you tend to struggle with hand pain because the materials do require a lot of wrestling into place. I hope you are well enough to finish it!